In 2012, I read a lot of books. In fact, I read so many that I never got caught up reviewing them, so I have a big list of books to review from then, as well as a handful that I've already read in 2013. My goal is to become up-to-date soon so I don't have to worry about catching up again. We'll see how that goes. This review is for a third book. 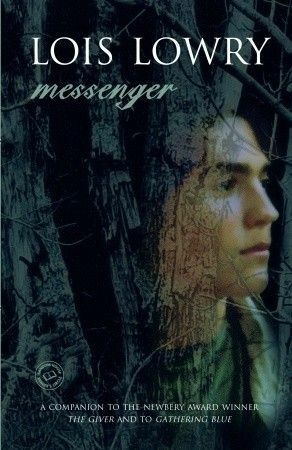 Messenger by Lois Lowry is the third book in a quartet, and I reviewed the first two already and will review the fourth one soon. Check out the review for book one, The Giver, HERE, and book two, Gathering Blue, HERE. Lowry presents Matty, a character we first met in Gathering Blue as Kira's friend, as the protagonist of Messenger. He has moved on from that area and now lived in the Village under the guidance of Seer, a blind man. Matty helps take care of Seer, just as Seer helps take care of Matty. Everyone in the Village has left another place, and they all have something "wrong" with them, whether it is physically apparent or not. Matty learns about someone called the Trader, who is a mystery to most young people in the Village, though curiosity gets the best of him. He soon learns too much and realizes he may have a power he has been unaware of. Jonas, the character from The Giver, is the leader of this community, and he recognizes Matty as an important part of it. Matty has to become braver than his age and go on a great adventure. I can't say more without ruining the book for potential readers. All I can say is that Lowry yet again does NOT disappoint. She saw the teenage dystopia trend long before it actually became a trend, and her novels always make me think, even as an adult. This book deserves five stars out of five, in my opinion. If you haven't read any of this quartet, please do so soon. The books are short, but they are powerful.